India beer market is witnessing significant growth on account of surging consumer preference for beer over other alcoholic drinks in past few years. Increasing personal disposable income, urbanization along with growing acceptance of social drinking are further complementing the growth of beer market in the country. Moreover, per capita beer consumption in India is extremely low as compared to other Asian countries such as China, which is the largest beer market across the world. Low beer consumption is posing huge opportunities for domestic and international beer players to come up with different product variants fulfilling the consumer demand. Off-trade channels including wine & beer shops, hypermarkets, and supermarkets have contributed majority of the revenue in India beer market share in 2017. The segment is projected to further rule the market owing to continuously increasing retail formats in the country and availability of beer products at reasonable prices via off-trade channels. Moreover, on-trade channels are anticipated to exhibit highest growth rate during the forecast period owing to rising income level coupled with acceptance of craft beer across the country. The India beer market report thoroughly covers India beer market by type, sales channel, packaging, demographics, and regions. 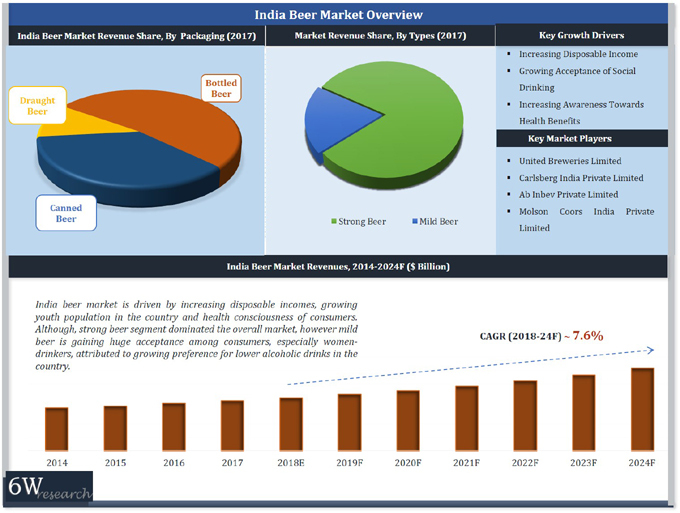 The India beer market outlook report provides an unbiased and detailed analysis of the India beer market trends, opportunities, high growth areas and market drivers which would help the stakeholders to decide and align their market strategies according to the current and future market dynamics.